16 rare scaly anteaters are back in the wild after being rescued from Vietnam’s illegal wildlife trade. This story was updated to reflect that the U.S. Fish and Wildlife Service today issued a preliminary finding to a scientific petition submitted by conservation groups, saying that Endangered Species Act protections may be warranted for seven species of pangolin. The United States is a destination for pangolin products, with nearly 30,000 imports seized here between 2005 and 2014. Pangolins are scaly anteaters about the size of a house cat. They’re presumed to be the world’s most trafficked mammal, with an estimated 100,000 plucked from the wild every year in Africa and Asia—that’s one pangolin captured every five minutes. Vietnam hits the trifecta in the illegal pangolin trade. It’s a source country, transit region, and destination all in one. Since 2011 authorities have confiscated roughly 1,450 live or whole pangolins and 8 metric tons of scales, according to the Environmental Investigation Agency, a London-based nonprofit that exposes environmental crimes. Until recently it was legal in Vietnam for officials to sell seized pangolins right back into the trade. But a law that came into effect in January 2014 reclassified them as endangered, which prohibits that practice. Some criminals still do it, though—as happened in February 2015 when forest rangers in Bac Ninh province resold 42 confiscated Sunda pangolins to local restaurants. Today, confiscated pangolins are likely to end up at the Carnivore and Pangolin Conservation Program’s rescue center, in Cuc Phuong National Park, not far from Hanoi. Since August 2014 the center, which was previously government-run, has been managed by an NGO, Save Vietnam’s Wildlife. The caseload has been growing sharply, with 142 pangolins taken in during the past 18 months, versus 160 during the previous eight years. Pangolins are sold by weight, so poachers often inject water under the animals’ skin or force-feed them limestone slurry—even stones!—to increase their profits. Many confiscated pangolins also have injuries from snare traps, abusive handling, or being wrenched from a tree during capture. To get those ants, pangolin keepers use a special tool like a giant pair of scissors at the end of a 15-foot-long (5 meters) bamboo pole. They snip ant nests from trees and catch them in large plastic bags. It takes half a day to collect two bags, about 50 pounds, of ants—enough to keep 70 pangolins satisfied for one day. After a week or so the pangolins are transitioned to a healthy mix of silkworm larvae and ants purchased from a supplier in south Vietnam. It costs about ten dollars a week (roughly one-quarter the average monthly salary in Vietnam) to feed a single pangolin, and on top of that are the costs of medicine, veterinary care, and keepers’ wages. It usually takes a month or longer for the pangolins’ wounds to heal and for them to regain their strength and recover from the trauma of being smuggled. Once they’re fit and free of disease, they’re returned to the wild. Locations are kept secret to prevent recapture, and the animals are monitored when possible. 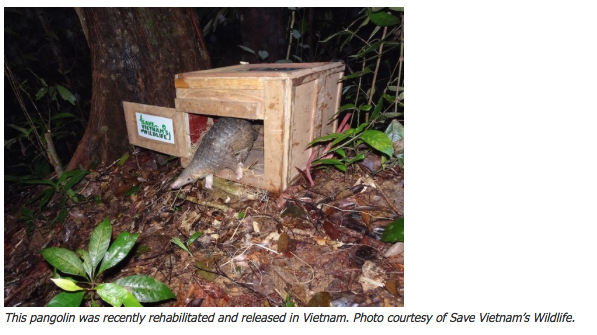 During the past eight months, Save Vietnam’s Wildlife has rehabilitated and released 75 Sunda pangolins, including, on February 17, a mother and her baby and 14 others. 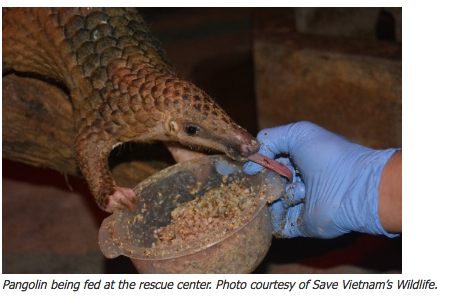 After traveling 20 hours and 500 miles (800 kilometers) by bus to the release site, the pangolins were given a send-off meal of ants and ant eggs before being carried deep into the forest in their transfer boxes. Because they’re nocturnal, this was done at night and in good weather to ease their transition and improve their chances of survival. They’re also territorial animals, so the males and females were released alternately, roughly 350 yards apart. Each release is fraught with tension and unknowns, as was the case with the mother and baby. She rolled out of the box with the baby pangolin in a protective clutch, but something startled them, and they became separated. The mother disappeared into the bush while the little one clung to a nearby tree. Van Nguyen leaped into action. Fearing they’d be separated for good, he grabbed the baby and ran after the mother, disappearing into the dark. Fifteen minutes later, he returned with a big smile. The little family was reunited and safe in their new home—at least for now. You can listen to Laurel’s interview with Save Vietnam’s Wildlife on her podcast, The WildLife.